This article expands on our last article, Part 1. Here we will focus on the process of handling nitrogen compounds in water, which create disinfectant byproducts (DBPs) like chloramines. This process is also an integral part of breakpoint chlorination, and creates combined chlorine. After all, handling bather waste is paramount in water chemistry. Buckle up, the chemistry can be pretty dense, and hopefully we can help you make sense of it. Combined chlorine is a measure of chlorine that has combined with nitrogen compounds in water. Some common types of combined chlorine are monochloramine and dichloramine, but there are countless others, and we refer to these types of combined chlorine as disinfectant byproducts, or disinfection byproducts (DBPs). Many health departments consider a combined chlorine level of 0.2 or higher to be problematic. Since there are so many types, many of us in the industry just refer to all of these compounds and DBPs as chloramines. This can get confusing, so we will try to keep it as simple as possible. Combined Chlorine can be broken into two subcategories: inorganic and organic. For example, monochloramine has about 1/150th the disinfecting power of HOCl. The benefit to inorganic chloramines being used as a disinfectant is longevity. Think of drinking water treatment. Free chlorine will be reduced quickly, but chloramines disinfect a lot slower, therefore they maintain a residual of disinfection power further down the water pipes. This can be a benefit in areas where the water must travel long distances from the water treatment facility. Another source of inorganic combined chlorine is water treatment chemicals containing nitrogen, such as ammonia, ammonium, etc. Several popular algaecides are ammonia-based, for example. Organic combined chlorine is formed from nitrogen that naturally comes from our bodies and the things we introduce to water when we swim. The primary culprit is something called urea, which gets oxidized down into ammonia and will continue to break down into a bunch of different compounds–hundreds of compounds, actually. So rather than inorganically introducing nitrogen for the purpose of chloramination, organic chloramines are formed as a result of using the pool. And organic chloramines are not used for disinfection...they're just a nuisance. Without nitrogen in our water, all chlorine would be free available chlorine until it is used up (reduced) through pool sanitization or oxidation. There would be no combined chlorine, since it is nitrogen compounds that chlorine combines with. Think nitrates, nitrites, ammonia, etc. 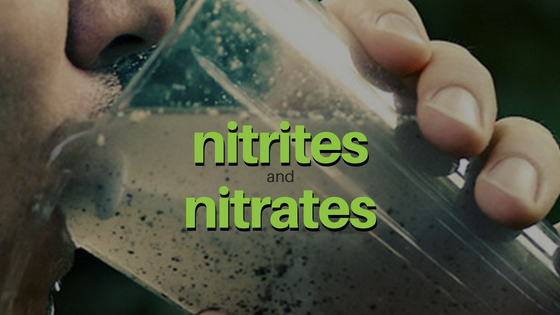 So we need a way to handle these nitrogen contaminants in water. For that, operators need to overcome combined chlorine by exceeding what is called "the breakpoint", and achieve a free chlorine residual above and beyond the combined chlorine. While some organic nitrogen may never be removed, even by shocking (superchlorination), most of the nitrogen in the water can be destroyed with enough chlorine and a secondary system like ozone or UV. For each subsequent reaction to take place, the HOCl:NH3 ratio needs to increase by about 5:1. So to go from monochloramine to dichloramine, it takes 5 more HOCl for every one monochloramine. It gets out of hand quickly. When swimmers pee in the pool (and they do...it's just reality), they introduce more than just urea to the water. Urine can contain over 100 types of nitrogen substances, amino acids, proteins, hormones, peptides and other organic contributors to this problem. All of these ingredients help explain why there are so many hundreds of different types of disinfection byproducts (DBPs). We could talk about all of the chemistry, but hopefully you get the point. These compounds are being oxidized by chlorine, combining, breaking down, and becoming some seriously nasty byproducts. Eventually these byproducts off-gas into the air and become a breathing issue, and that's where we at Chloramine Consulting come in. As you now know, it's not just chloramines that we are talking about, but we use the term to generally describe all of these myriad DBPs. When they finally get oxidized to the point of going airborne, these compounds are heavier than oxygen, and stay low in the natatorium...right in the swimmers' breathing zone. If you have ever been a competitive swimmer, you're not just breathing there; you're gasping for air and exerting yourself. Bronchial Asthma Due to Sensitization to Chloramine T.
The list goes on, and on. There's even a condition called "Lifeguard Lung", describing a common illness faced by people who frequent indoor pools (like lifeguards). So we know these DBPs in the air are harmful and obnoxious. And we now also know how complicated it can be to oxidize nitrogen out of the water in the first place. Since there is no "cure-all" chemical that can break down ammonia quickly and efficiently (yet), providing a healthy and pleasant environment for swimmers takes a coordinated approach from both water and air professionals. On the water side, secondary systems like UV, Ozone, or HDO should be used on indoor pools. We strongly recommend using enzymes as well, to further optimize chlorine, so it has less organic waste to oxidize, and more power to burn through the nitrogen compounds and germs. Aquatic professionals should be thinking about the swimmer's experience first. Good circulation, turnover rates, filtration and pH control are all important. The lower the pH, the higher the % of HOCl, meaning stronger chlorine. On the air side, architects and mechanical engineers need to communicate with the pool designers and operators! This does not happen enough. So often we find facilities that have HVAC systems that simply do not match the pool, or are incapable of handling the way the pool is operated. Communication between parties is paramount for success. In conclusion, handling the nitrogen problem is a water chemistry challenge that has air quality consequences. Regardless of how good your system is, or how great the operator is, bather loads are bather loads. Chloramine issues are inevitable, but can also be held to manageable levels. We hope this article helps understand the science behind the air quality issue in indoor pools. In future articles, we will break down the air quality problem from a mechanical point of view, and speak more about air physics and natatorium design. After all, it takes a good air design that matches a well-operated pool to conquer the IAQ chloramine issue. And here at Chloramine Consulting, that's exactly what we do.